So here we are the second F&F Challenge of 2015 .... I am so excited to be hosting this Challenge which is being sponsored by Sweet Lilac Flowers & Fresh Brewed designs. I chose 'Wings and Things' as the theme because here in the UK at this time of year we are looking forward to Spring returning, seeing the garden coming back to life after the Winter always amazes me and the thing that gives me greatest pleasure is seeing all my feathered friends nesting and feeding their chicks. So here is my card, it is a 7x7 card with the front folded back. The stamps I used are all Clarity stamps, this set called Garden Birds is amongst my favourite ever stamps ... I love Bluetits they are so acrobatic. I set the scene by masking off the stamped birds and creating a cloudy sky using torn paper as a mask whilst adding stonewashed adirondak ink with a make up sponge ... I'm afraid you can hardly see it in the photo. I then dabbed a bit of pink ink onto some pretty plain white Sweet Lilac Flowers to give a little dimension. 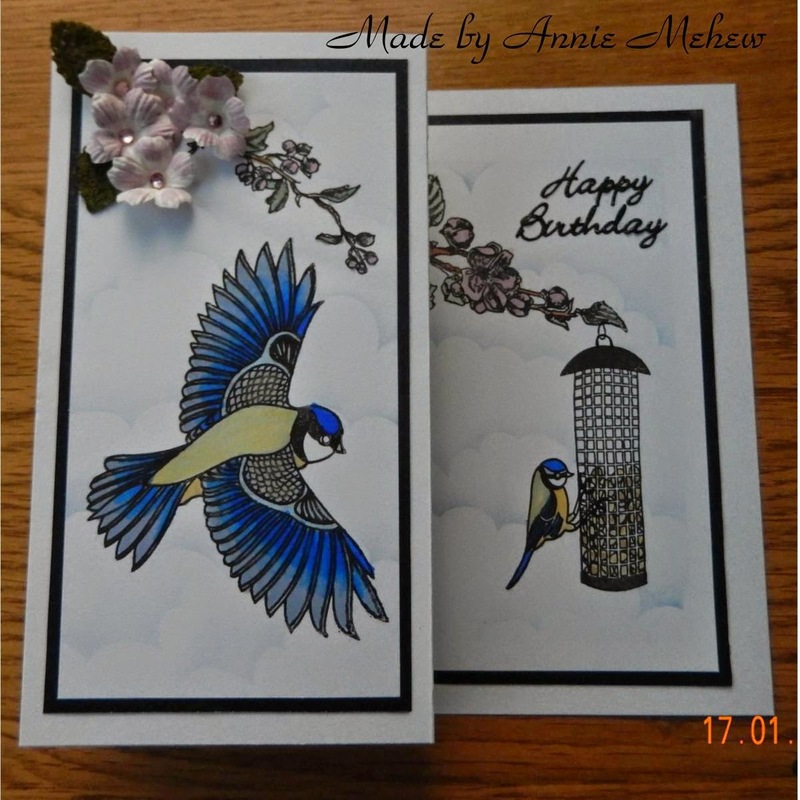 Here is the card folded flat ready to slip into the envelope ready to send to my dearest Mum in Law Marie who is 94 this February ... she isn't so mobile these days and loves to watch the birds on the feeders through the window of her little flat, in the sheltered housing complex where she lives. The Fussy & Fancy Girls would love you to enter this challenge, I know I love looking at all your work and leaving comments on your blogs you can get details of how to upload your work here it's really easy so why not give it a go. Hi Annie!! Your colouring is STUNNING...such a beautiful card!!! It certainly makes me think of Spring and all it's lovely creatures waking after their winter's rest! You've chosen a perfect theme to get us in the mood for Spring!! Wishing you a most wonderful weekend Annie!! Hi Annie~~OMGosh this is the most Gorgeous Card!! Beautiful Beautiful Beautiful birds and Blue is my fave color--so Real!!! Love how you added the flowers to the branch stamp:) Have a wonderful day!! 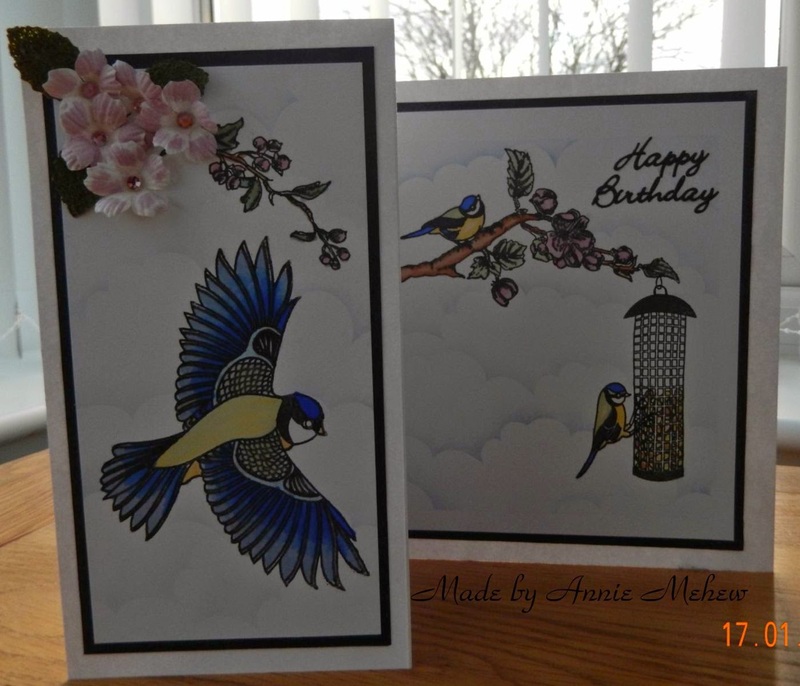 Beautiful card Annie...love your pretty coloring and details....I am sure it will well received by your MIL! !